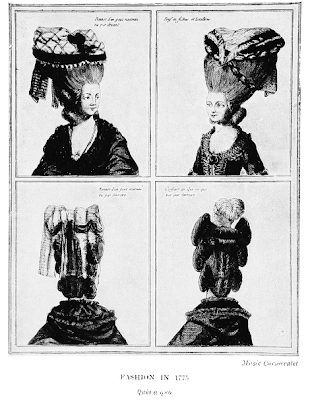 The winter of 1774 was approaching its end, when a new fashion of hairdress made its appearance, and was baptized the Ques aco. "It consisted of a panache in plumes, which the elegant ladies wore at the back of their heads." The name Ques aco is supposed to have been taken from a memoire by Beaumarchais, directed against a certain Marin, whom the author had ridiculized. The memoire of Beaumarchais had an enormous success, and the expression of Ques aco became very popular. A month after the introduction of the Ques aco a new invention took its place; it was the famous pouf aux sentiments. 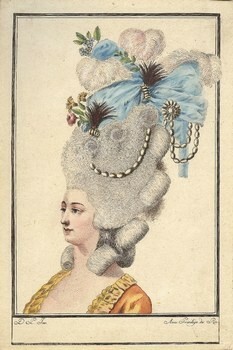 "The pouf aux sentiments," writes the continuator of Bachaumont on April 26, 1774, "is a new hairdress which has succeeded the Ques aco, and is infinitely superior to the former, on account of the numerous things which were required for its composition, and the genius employed to vary it artistically. It is called pouf on account of the numerous objects which it can contain, and aux sentiments because these objects must have a certain relation to what one loves best, and express one's preferences. Every woman is madly anxious to have a pouf."